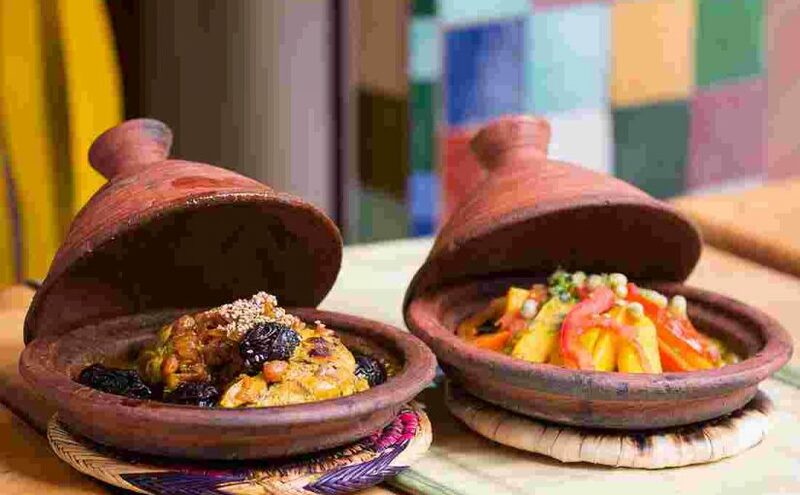 Moroccan Local Dishes they abound with subtle spices and intriguing flavour combinations. Learn how to make these classic Moroccan dishes, dishes like Couscous, Tagines. Plus info about Moroccan street food. Â In this collection of aromatic tagines, salads, side dishes and sweet things, youâll be sure to find best-loved classics from the Moroccan kitchen. Traditional Lamb Tagines provides winning combinations of sumptuous flavours such as Lamb Tagine with Prunes, Apricots and Honey. Beef, Kefta and Sausage Tagines includes options such as Chorizo Tagine with Lentils and Fenugreek. Classic Lamb Shank Tagine | Jamie Oliver. This gorgeous lamb tagine recipe produced melt-in-your-mouth results every time. Jamie takes some classic Moroccan flavours and techniques the shows you every step of the way plus how to finish it off beautifully. And the best thing about tagine cooking is there is minimal washing up – brilliant. Â Tasting Party Recipes: How to Make Moroccan Spiced Lamb Stew, with Joey Altman | Pottery Barn. In the âTasting Party Recipesâ video series, watch Chef Joey Altman show you how to make delicious recipes with flavors from around the world. In this video, Chef Altman shows you how to make Moroccan Spiced Lamb Stew, one of the lamb recipes inspired by the flavors of North Africa. This Moroccan stew is made up of apricots, raisins, chickpeas, tomatoes, and interesting spices. First, marinate the lamb in fresh spices and keep in the refrigerator. Then, add olive oil in a pan and sautÃ© onions in it. Add the marinated meat. Let the lamb cook on one side for some time. Then stir and add garlic, chickpeas, dried apricots, raisins, harissa, tomatoes, water, and salt. Bake this in the oven for two hours to cook. These lamb recipes can be served in accompaniment with couscous and mint. Garnish the lamb with yoghurt sauce and pistachios. Follow these simple steps on how to make Moroccan Spiced Lamb Stew for a simple but delicious meal. Street Food of Marrakech. Moroccan Tajine, Msemmen and More, Jemaa el-Fna. Moroccan Local Dishes. Couscous with Seven Vegetables.Â Moroccan Local Dishes. – You can also use fresh fava beans, potatoes, or other vegetables of your choice. – In the bottom of the couscous pot, combine the meat, olive oil, saffron, turmeric, ground ginger, pepper, and salt. Add the chopped onion, and mix. Brown the meat for a few minutes, then add the grated tomato and the fresh herbs. – Cover the meat with water. Drain the chickpeas and add them to the rest of the ingredients. – Cover the pot and let the meat cook for around 20 minutes and start preparing your couscous. – Place the couscous in a large plate, I am using the Moroccan traditional couscous plate called Gasaa. – Add some cold water, and work the couscousâ¦ lift the grains, rub them, give them some love and make sure they are all coated with water. – place the couscous top over a plate, to minimize kitchen mess, and transfer the couscous in the couscous top. Donât worry, the moist couscous grains wont fall through the holesâ¦ I promise. – After cooking the meat for 20 minutes, place the couscous top over the couscous bottom. Seal both pots with a cheesecloth or foil, this way we donât lose any steam. – After 5 minutes of so, you will notice steam rising from the couscous. Now start your timer, and let the couscous steam for 15 minutes. – Timeâs up! Empty the couscous in the large plate, and gently break the couscous grains with a fork. We dont want any lumps. – Add vegetable oil, and continue fluffing the couscous. – Add a large pinch of salt. Mix. – Now add a little bit of water, and continue fluffing. – Let the couscous rest while you start cooking the veggies! – Cook the root vegetables first: carrots, sweet potatoes, and turnip. These require more cooking time. – Place them with the meat and add boiling water to cover it all. – Transfer the couscous in the couscous top and place it back over the meat. Seal both pots. – After 5 minutes of so, you will notice steam rising from the couscous. Now start your timer again, and let the couscous steam for 15 minutes. – Timeâs up! Empty the couscous in the large plate and fluff. – Add a little bit of water and gently break all the lumps with a fork. – Let the couscous rest for 5 minutes while you are cooking the other vegetables. – First letâs check on the root vegetables. My carrots still need a bit more cooking timeâ¦ but the turnips and sweet potatoes are ready! Itâs time to remove them from the pot and place them in a plate. – Letâs add the other vegetables: zucchini, pumpkin, and cabbage. – Let the couscous steam for 15 minutes or until done. – Empty the couscous in the large plate, and fluff again with butter (or Moroccan Smen)! – Check the veggies and remove the ones that are ready out of the pot. – Remove the herbs and discard. – Check on the meatâ¦ mine still needs some cooking. – In my case, I will close the pot and let the meat cook a bit more. – Time for all the veggies to come back to the pot. – First place the couscous grains in a dome shape. – Pour some of the broth over the couscous grains. – Place the meat in the center. Arrange the veggies around and on top of the couscous. – In a separate bowl, pour the broth and serve on the side. Â In this collection of aromatic tagines, salads, side dishes and sweet things, youâll be sure to find best-loved classics from the Moroccan kitchen. Traditional Lamb Tagines provides winning combinations of sumptuous flavours such as Lamb Tagine with Prunes, Apricots and Honey. Beef, Kefta and Sausage Tagines includes options such as Chorizo Tagine with Lentils and Fenugreek.Â Moroccan Local Dishes. Also Bed Breakfast Bed and Breakfast B&B BB or BnB details for your next vacationÂ Regional Cuisines local information guide. B and B is an English traditional holiday idea, often hard to find in some parts of the world.